“Faith cometh by hearingand hearing by the Word of God.” Reading God’s Word is anencouragement to our faith. When we read the great stories of the Bible, we see how God worked in the lives of others and how He can work in us as we yield our lives to Him. 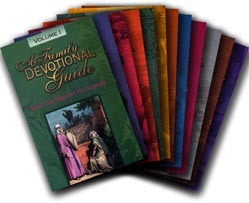 These stories are also available in Family Devotional Guides which include a series of questions accompanying each story, designed to help every member of the family listen with added attention as the story is read. Congratulations, you answered all of the questions correctly!